One of the biggest pleasures when it comes to beauty is learning new skincare tips and discovering new ranges from around the world. 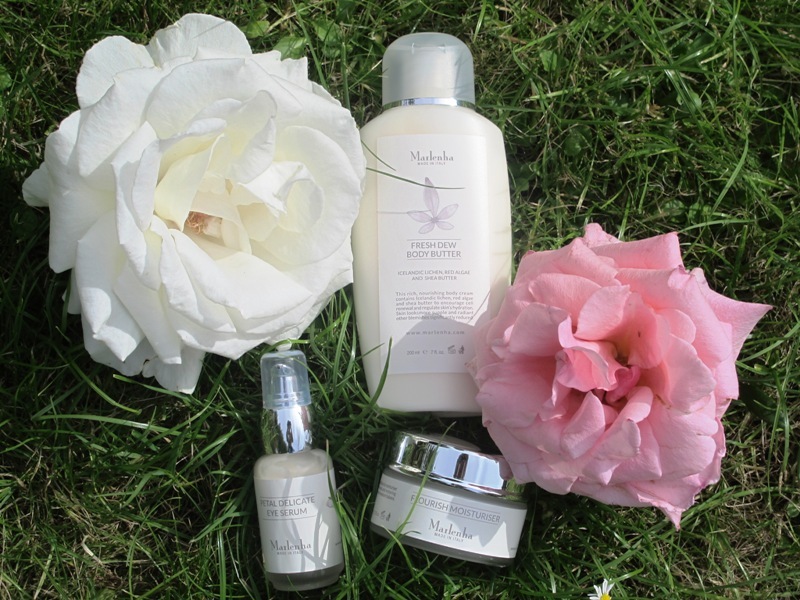 Recently I met with Emanuele Marogna, who has introduced Italian artisanal beauty range Marlenha to the UK market. Emanuele was born in the romantic city of Verona, which gave the world Romeo & Juliette and I couldn’t resist asking him if he actually uses Marlenha range ( the man has wonderful skin ), to which he replied that he tried the products but delegates using them to his wife ( who swapped a few creams from well-known brands in her arsenal to the Marlenha ones ). Emanuele’s professional background was in computers but aged 23 he decided to try something new and started the company designing artisanal flip-flops, as he was inspired by the genuine passion for beautiful products that I think many Italians are simply born with – the country is so beautiful, so rich in culture and has such delicious food, no wonder it produces wonderful artisans, which is obvious even in tiny villages when you drive around Italy. Emanuele came across the artisan who Marlenha products a couple of years ago ( the gentleman in question has been doing so since the 70s ), but since Emanuele came on board the products have been rebranded and the focus now is on quality, as well as the freshness & products smell. Freshness is the term more often used when it comes to food you might say? Well, in case of Marlenha the products are made to order and you should use them within 12 months of opening. The products aren’t completely natural, as they contain silicones for example but then Emanuele’s opinion is that many people approach the term ‘natural’ as a trend and pretend to be something they are not. Marlenha doesn’t fall in this category, instead this beauty product range is hand-crafted in Italy with the finest ingredients, natural or vegetable derived when possible, and packed by hand. Petal Delicate Eye Serum, 30 mls, £67: this serum has a delicately light texture that sinks in very quickly when you tap it gently in and around your orbital bone. Main ingredients here are edelweiss stem cells, hyaluronic acid and borage oil ( rich in Omega 3 & 6 ), which is essential in helping us maintain skin’s elasticity. After about three weeks of use I noticed that the area under my eyes looks more even – because of late nights I tend to get dark shadows – and somehow my eye area looks brighter in the morning. The recommended age to start using this eye serum is upwards of 3o. I also very much like the delicate glass bottle, with a strong silver pump and the neck of the bottle looking and feeling to the touch like a perfectly polished silver ring – making it a pleasure to look at on the bathroom shelf, as well as holding it in your hand – it feels like it belongs in the circle of your fingers. The serum has a delicate bamboo fragrance that is beautifully feminine and when you apply it, the eye area will appear plumper and brighter by the time you finish its application. It also makes a lovely base for your concealer and eye-shadow in the morning. Bloom Anti-age nourishing cream, 50 mls, £62 ( I haven’t tried or used this cream which has edelweiss stem cells & elastin liposomes as its leading ingredients. I was assured that no endangered flowers were harmed while producing this cream, targeted at mature skin – starting from 45-50 years old. Some of its ingredients are similar to the eye serum. As this cream is highly concentrated, you extend its use to your neck and decolette area ). Blossom Elixir, 50 mls, £44 ( I haven’t experienced this multi-action treatment with argan, rosehip & jojoba oils but it promises to protect the skin from external aggressors, as well as nourish and firm ). Flourish Moisturiser, 50 mls, £49 (this rich but light in texture moisturiser fuses together the fountain of youth that is hyaluronic acid with collagen beads, plumping up your skin and helping boost skin’s moisture levels. It is a moisturiser that works well in cold months, when your skin feels ragged and dry, as well as in the summer, particularly when you go on a holiday to warmer and sunnier climates. Dot a little bit of this moisturiser all over your face and then massage with strong strokes, boosting the circulation and speeding up lymphatic drainage, leading to a healthier, brighter complexion. It creates a nice canvas for make-up application in the morning, as well as helps your skin to regenerate at night). Fresh Dew Body Butter, 200 mls, £42 ( this body butter was developed to help the skin on your body remain supple and well-moisturised. Let’s be honest and admit to ourselves that we tend to pay much attention to our faces, rather than our bodies! This body butter has Icelandic lichen, red algae ( known for its anti-oxidant properties ) and shea butter that together encourage cell renewal process. This cream promises to reduce stretch marks but I can’t vouch for that simply because I don’t have any – the secret is genes and using aromatherapy oils during pregnancy and beyond. It does have a texture of a body lotion but nurtures the skin as a body balm, sinking in without a trace, bar a little bit of immediate radiance, into your skin. It does have a strong flowery smell but in a pleasant way and if you apply it straight after shower or bath you will feel as it your skin has some dew on it, adding a feeling of lightness. What also catches the eye when it comes to Marlenha is the beautiful cream paper packaging, with artistic flower motives on the boxes and distinct writing and descriptions. This makes the range feel truly artisan and personal, reminding you of old-fashioned pride that is often forgotten or taken for granted. Another interesting fact is that Marlenha doesn’t do samples in plastic packaging.